49mm X4 3-Stop ND (Neutral Density) Filter For Camera Lenses – Breakthrough Photography Featuring SCHOTT Superwhite B270 optical glass made in Germany, MRC16, and nanotec nano coatings, the X4 ND is among the most color neutral filters available to photographers. The 3-stop X4 ND features an incredibly durable weather-sealed traction frame that makes getting filters on-and-off a whole lot easier. 58mm X4 3-Stop ND (Neutral Density) Filter For Camera Lenses – Breakthrough Photography Featuring SCHOTT Superwhite B270 optical glass made in Germany, MRC16, and nanotec nano coatings, the X4 ND is among the most color neutral filters available to photographers. The 3-stop X4 ND features an incredibly durable weather-sealed traction frame that makes getting filters on-and-off a whole lot easier. 49mm X4 6-Stop ND (Neutral Density) Filter For Camera Lenses – Breakthrough Photography Featuring SCHOTT Superwhite B270 optical glass made in Germany, MRC16, and nanotec nano coatings, the X4 ND is among the most color neutral filters available to photographers. The 6-stop X4 ND features an incredibly durable weather-sealed traction frame that makes getting filters on-and-off a whole lot easier. 77mm X4 10-Stop ND (Neutral Density) Filter For Camera Lenses – Breakthrough Photography Featuring SCHOTT Superwhite B270 optical glass made in Germany, MRC16, and nanotec nano coatings, the X4 ND is among the most color neutral filters available to photographers. The 10-stop X4 ND features an incredibly durable weather-sealed traction frame that makes getting filters on-and-off a whole lot easier. 72mm X4 10-Stop ND (Neutral Density) Filter For Camera Lenses – Breakthrough Photography Featuring SCHOTT Superwhite B270 optical glass made in Germany, MRC16, and nanotec nano coatings, the X4 ND is among the most color neutral filters available to photographers. The 10-stop X4 ND features an incredibly durable weather-sealed traction frame that makes getting filters on-and-off a whole lot easier. 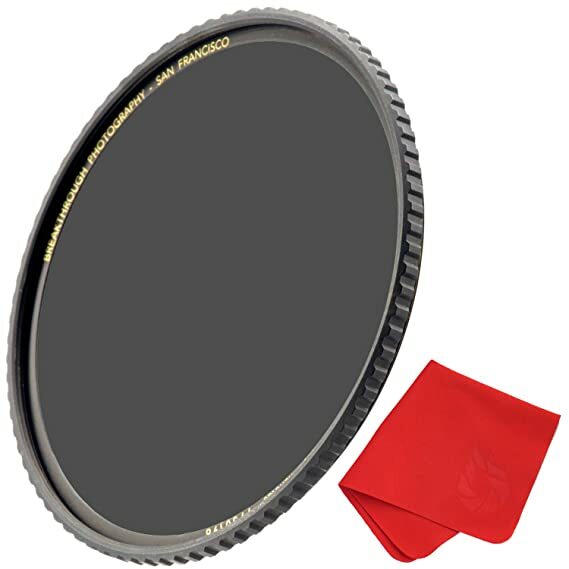 95mm X4 10-Stop ND (Neutral Density) Filter For Camera Lenses – Breakthrough Photography Featuring SCHOTT Superwhite B270 optical glass made in Germany, MRC16, and nanotec nano coatings, the X4 ND is among the most color neutral filters available to photographers. The 10-stop X4 ND features an incredibly durable weather-sealed traction frame that makes getting filters on-and-off a whole lot easier. 82mm X4 3-Stop ND (Neutral Density) Filter For Camera Lenses – Breakthrough Photography Featuring SCHOTT Superwhite B270 optical glass made in Germany, MRC16, and nanotec nano coatings, the X4 ND is among the most color neutral filters available to photographers. The 3-stop X4 ND features an incredibly durable weather-sealed traction frame that makes getting filters on-and-off a whole lot easier. 77mm X4 3-Stop ND (Neutral Density) Filter For Camera Lenses – Breakthrough Photography Featuring SCHOTT Superwhite B270 optical glass made in Germany, MRC16, and nanotec nano coatings, the X4 ND is among the most color neutral filters available to photographers. The 3-stop X4 ND features an incredibly durable weather-sealed traction frame that makes getting filters on-and-off a whole lot easier. 62mm X4 6-Stop ND (Neutral Density) Filter For Camera Lenses – Breakthrough Photography Featuring SCHOTT Superwhite B270 optical glass made in Germany, MRC16, and nanotec nano coatings, the X4 ND is among the most color neutral filters available to photographers. The 6-stop X4 ND features an incredibly durable weather-sealed traction frame that makes getting filters on-and-off a whole lot easier. 52mm X4 3-Stop ND (Neutral Density) Filter For Camera Lenses – Breakthrough Photography Featuring SCHOTT Superwhite B270 optical glass made in Germany, MRC16, and nanotec nano coatings, the X4 ND is among the most color neutral filters available to photographers. The 3-stop X4 ND features an incredibly durable weather-sealed traction frame that makes getting filters on-and-off a whole lot easier. 67mm X4 6-Stop ND (Neutral Density) Filter For Camera Lenses – Breakthrough Photography Featuring SCHOTT Superwhite B270 optical glass made in Germany, MRC16, and nanotec nano coatings, the X4 ND is among the most color neutral filters available to photographers. The 6-stop X4 ND features an incredibly durable weather-sealed traction frame that makes getting filters on-and-off a whole lot easier. 46mm X4 6-Stop ND (Neutral Density) Filter For Camera Lenses – Breakthrough Photography Featuring SCHOTT Superwhite B270 optical glass made in Germany, MRC16, and nanotec nano coatings, the X4 ND is among the most color neutral filters available to photographers. The 6-stop X4 ND features an incredibly durable weather-sealed traction frame that makes getting filters on-and-off a whole lot easier. 77mm X4 6-Stop ND (Neutral Density) Filter For Camera Lenses – Breakthrough Photography Featuring SCHOTT Superwhite B270 optical glass made in Germany, MRC16, and nanotec nano coatings, the X4 ND is among the most color neutral filters available to photographers. The 6-stop X4 ND features an incredibly durable weather-sealed traction frame that makes getting filters on-and-off a whole lot easier. 52mm X4 10-Stop ND (Neutral Density) Filter For Camera Lenses – Breakthrough Photography Featuring SCHOTT Superwhite B270 optical glass made in Germany, MRC16, and nanotec nano coatings, the X4 ND is among the most color neutral filters available to photographers. The 10-stop X4 ND features an incredibly durable weather-sealed traction frame that makes getting filters on-and-off a whole lot easier.